Aargh Mateys! We've been hard at work, slogging through pages and pages of books to bring you a quick list of our current favorite nautical, watersports and marine themed books for the younger crew members of the ship, that is the 5 and under set. This is a very simple story about two friends, Boat and Wind. Boat enjoys immensely playing with Wind, splashing over the waves, under the sunshine, every day. Over time, however, their relationship changes and Boat starts to wonder if Wind was ever really his friend at all. This beautifully illustrated book has a very profound and meaningul message, expressed in this modern day parable that really touches your heart. That's the adult view. The kids say, "Read it again, Mama!" 'Nuff said, huh? We really cannot read it enough. 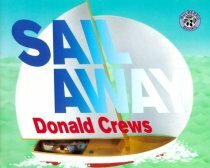 Donald Crews book about a family's outing on their sailboat is visually rich and incredibly appealing. It's an exciting time out on the water, and Crews' illustrations speak a thousand words and emotions as the family in the book set out into the bay, under the bridge, out on the sea, through a storm and back home safely again. It really brings the thrill of sailing alive. 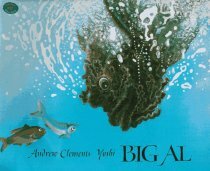 Big Al is not a new book, but its new to us, and we all loved it. Big Al is an ugly, scary fish in the sea. He desperately wants friends and works very hard at it. Unfortunately, nothing seems to work as the smaller fish are definitely intimidated by Big Al's scary looks and size. This all changes one day when Big Al's big heart shows more than his big teeth or scaly skin and the little fish in the sea learn to love Big Al. Very heartwarming and a great message for kids, and adults too- of course. Great illustrations by Yoshi. Check our bookstore for new and used copies of these books, and help support Kids Aboard at the same time. The bookstore link is below. Next time we will be reviewing a whole pile of picture books for the 5 and up crew members.